Do you love old coins, but hate to see them sitting in a drawer? I know I do. Coins are fun to wear as jewelry, but commercial coin bezels are so ho-hum. Did you know that we can turn your coin into a unique piece of Native American jewelry? A lot of our customers have requested bolo ties, but we’ve made pendants, money clips (now that’s clever!) and bracelets. The coins are set firmly in separate bezels, so there is no damage to the coin itself. 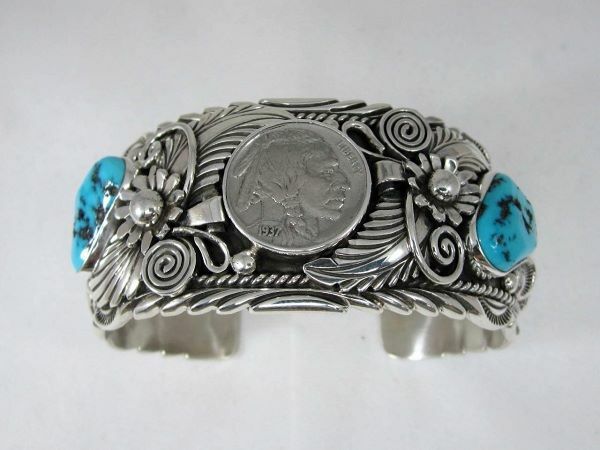 Take a look at these great pieces made right here in our shop by master silversmith Henry Yazzie! Check out our website at OldTownJewels.com or contact us for more information at info@oldtownjewels.com about how we can make something for you! This entry was posted in Blog, Custom Gallery and tagged Custom Pieces, Henry Yazzie.